Samantha Huang, "Read Between the Lines", 2011, cut-out book, 6 x 10 x 3"
Brian Dettmer, "Egyptian Book of the Dead", 2008, altered book, 9 x 8 x 7"
They include Brian Dettmer, a Georgia artist who makes fantastical sculptures out of surgically exposed antiquarian books; Richard Shaw, the legendary Bay Area maker of trompe l’oeil ceramic sculpture; multi-media artist Kota Ezawa; and East Bay filmmaker Elizabeth Sher whose “blog” — of sorts — consists of Torah-like scrolls filled with automatic writing in an alphabet she devised. 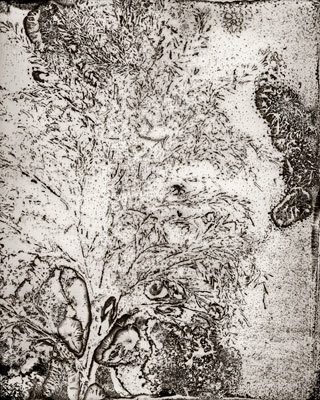 You’ll also find the stunning Oliver Sacks-Abelardo Morell collaboration, The Island of Rota, about which I’ll say more, as well as works from Lisa Kokin. Her thread-based sculptures, which hang in mid-air, dispense almost entirely with the stuff of which books are made, save the words themselves. It’s along this continuum — between literal “bookness” and its opposite – that the creative energy in this show flows. While many works dazzle with outlandish visual effects – created from slicing, sawing, weaving, sewing, compressing, sanding, accessorizing and even vulcanizing the raw materials — the richest experiences come from an unexpected quarter: artists who treat the book conventionally. That is, they place pictures and words between two covers. Given the number of artists in this show who are substantially extending book art’s formal possibilities, the success of these old-school storytellers surprises. So to draw a contrast between the two camps, let’s look first at some of the innovators. Doug Beube, a New York-based photographer and mixed-media artist, submits three strong works. Masked Words, a dictionary bent and sculpted into the shape of a Pacific Islander mask, suggests how language, like masks, can reveal or conceal meaning. (This one is perfectly inscrutable.) His modular book, Zipper Theory, an ode to our cut-and-paste culture, allows viewers to mix and match content by zippering together pieces of three different books. 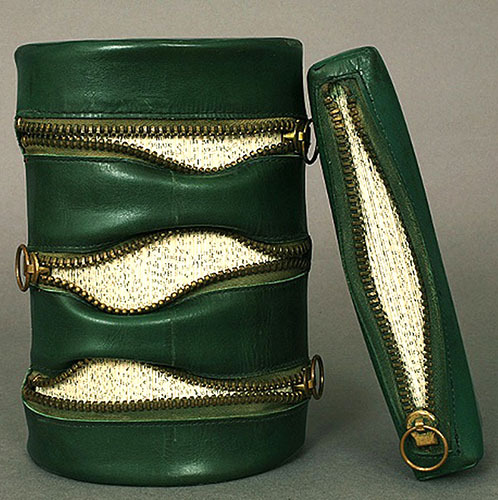 Pocket Book, two leather pouches filled with unidentified philosophical essays, shows how belief systems can be coopted by fashion and worn as accessories – just as they are in real life. 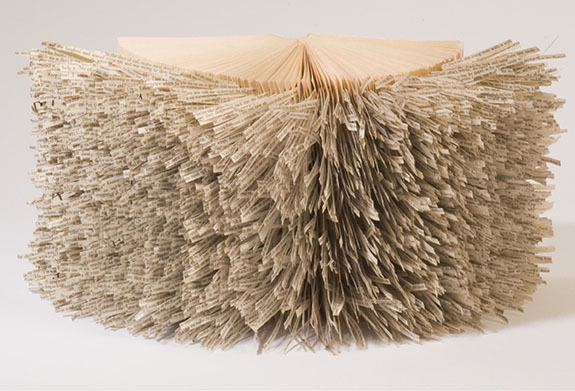 Samantha Huang, a Londoner, slices out lines of a book and attaches them to the tome’s edges, producing an animal-like object you’ll want to stroke, suggesting, unintentionally perhaps, that censorship might not be such a bad thing. Luna, Daniel Essig’s cathedral-like sculpture, topped by a book whose Coptic binding recalls an Elizabethan collar, gives off a lasting talismanic vibe. I also admired Emily Payne’s Wave, built of compressed, upwardly warped book pages that depict a wind-swept sea, and Marie Dern’s and Danielle Giudici-Wallis’ Crow, a tree trunk made of woven paper filled with printed pages, each containing a single word. The words come from a found, handwritten note whose author sought the return of a half-blind pet crow. It’s pinned to the sculpture. Two other works caught my eye: a “digital over analog” book from Penny Nil and Mohammed Alallabadibi, about eclipses, which includes an embedded iPad app for taking in pictures and sound; and, a pair of linocut rubber stamp newspapers that parody, with mock ads, the very technology that is supposed be rendering newspapers extinct. It’s the work of Mary Marsh and Quite Contrary Press. In the end clever craft and technology only go so far. For me, the above-mentioned Sacks-Morell collaboration and a book by Peter Koch Printers, The Lost Journals of Sacajewea, trump everything else. Sacks, the world-renowned neurologist and author, ruminates about many things: his transcendent nature experiences, the color blindness of a group of Micronesian islanders, and the natural history of Rota, an island near Guam whose long-extinct plants dwarfed in size any trees on Earth today. His prose lights up Morell’s intoxicating images of plants. 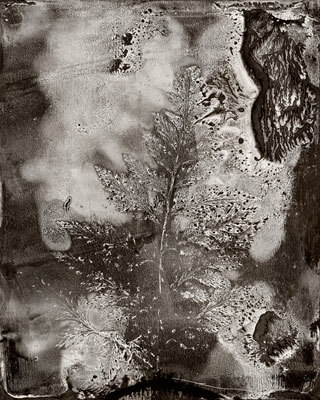 Ink-stained, imprinted on glass, scanned and digitally output to paper, they combine the luminous quality of photograms with the high-contrast look of vintage gelatin silver prints. Together, with Sacks’ words, they make you feel as if you are peering into the primordial past. So do the words of Native American author, Debra Magpie Earling. She re-creates in diary form the thoughts of Lewis and Clark’s Native American guide, and she does so in rough, concrete poetry that credibly evokes the experience of accompanying the two white explorers. If you look beyond the exaggerations and misconceptions that have historically dogged the Sacajewea legend and focus instead on the scenes conjured by Earling’s words – and by the cloudy vintage photos of plains, bison and the like selected by Koch — you’ll find yourself transported into the world of a woman whose reality we can scarcely imagine. As Seager writes in an introductory statement for the show’s catalog: “When form and content are in perfect agreement, there is a harmonic chord that is struck, deepening the experience and transforming book into art.” The seventh installment of this show strikes many such chords. 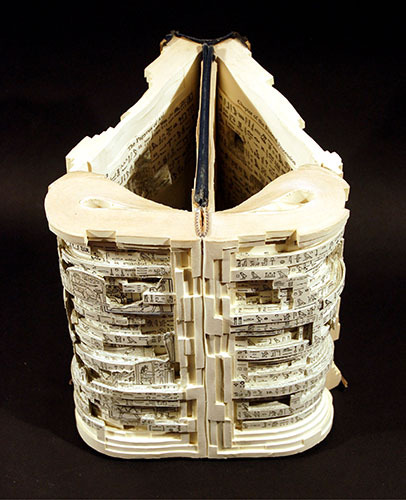 “The Art of the Book” @ Seager Gray Gallery through May 31, 2012. Interesting post about the Seager Gray book exhibit. For years, I have found the annual art of the book exhibit to be the most compelling art exhibit in Marin.